Deer wreak havoc in gardens. Not only do they decimate flowers and plants, they carry diseases communicable to livestock and humans. If you live in an area where your garden is susceptible to invasion by deer you can either limit your landscaping to plants deer don't like or use some method of deer control. Deer deterrents include methods that inflict pain with electric shock or capsaicin derived from chili peppers, cause fear with motion sensitive sprinklers and dogs, or target smell with garlic, scented soap bars, moth balls and essence of rotten eggs and decaying flesh. And don't forget the lion and coyote urine. Deer repellent fertilizer has several advantages. 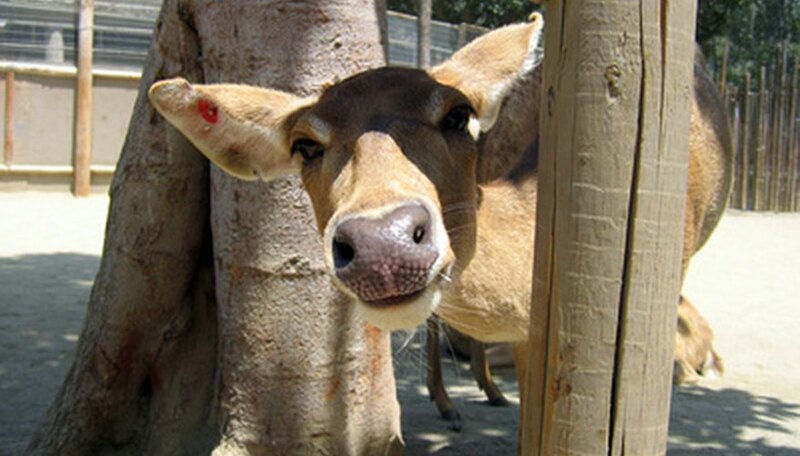 Deer repellent fertilizers feed your plants while offending the deer's acute and sensitive sense of smell. They are relatively inexpensive and don't harm the deer. Fish emulsion is perhaps the most common fertilizer that repels deer. Its pungent odor, however, may also repel people. Milorganite, biosludge from sewage, has been found to be an effective weapon against deer destruction. In April 2009, the University of Georgia's College of Agricultural & Environmental Sciences stated that "the organic, slow release fertilizer can be safely applied to plants, without the risk of burning, while providing long-lasting results." Spray fish emulsion, diluted according to manufacturer's directions, on plants as well as applying it around plants to feed roots. In Denny McKeown's Bloomin' Tip Sheet, Chris Beytes quotes Brad Roeller, a deer-repelling expert with the New York Botanical Garden, as advising spreading milorganite around your beds at "half the labeled rate for turf ... with your first application early in the spring when bulbs and early perennials are emerging.Then apply it again four weeks later." Beytes advises against spraying during freezing conditions. He states, "It can cause as much damage as a deer." Roeller warns against overdoing the application of milorganite. Stick to half the recommended amount. In April 2009, the University of Georgia quoted the price of a 40-lb. bag as ranging from $7 to $10 and reported that milorganite is commercially sold by fertilizer dealers throughout the United States. Fish emulsion is available everywhere from grocery stores to nurseries and garden supply dealers and runs about $9 a quart as of 2011. Based in Redding, California, Barbara Bryant has been writing memoirs and articles since 1999. She has published articles online for Faith and Fitness and other websites and she completed a course in creative writing at Shasta College. Bryant holds a Bachelor of Arts in psychology from the University of California at Santa Cruz.